A quiet family owned riverside park in the centre of the village. Fishing, boating & excellent walking area. All adulte caravan club location in the nature paddock to the rear of the properties. Open Mar-Nov. £12 per pitch per night including hook up, shower and laundry. A small quiet park on village outskirts. 9 miles from Cambridge, close to the Imperial War Museum, Duxford. Located close to the university town of Cambridge. Explore the old streets, ancient colleges and attractions. The site has a peaceful and relaxing atmosphere or even taking a punt along the River Cam. Imaginatively landscaped site set in old quarry workings with a countryside impression. Only 10 mins bus ride into Cambridge city centre. Fields End Water boasts 33 fully serviced pitches, with brand new high quality facilities and excellent Fen views. We also have two on site well stocked fishing lakes, to suit fishing for all levels. This is an attractive site situated ½ mile west of picturesque Grafham village and a similar distance north of Grafham Water, both of which are accessible by public footpath. The site has a heated outdoor swimming pool. A well-maintained, family-run, award-winning touring park. On the banks of the Great Ouse with spectacular views across the river to the National Trust's Houghton Mill. Small, well laid out site overlooking our boat marina & the River Great Ouse & within walking distance of Huntingdon town centre. A pretty area has been created for caravans & tents beside the marina, with wide views across the Ouse Valley. A friendly family site set in an apple orchard, with 25 fully-serviced pitches and a beautifully designed, spacious toilet block. 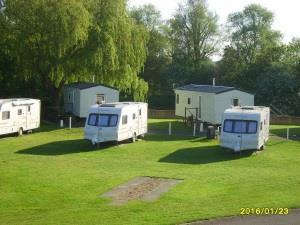 We are a holiday park set in the grounds of a large country house in the Norfolk Fenland countryside. We offer peace and tranquillity. The ideal place to get away from it all. On the banks of the River Ouse with plenty of sports facilities in the area. Stroud Hill Park is 5 star, award winning, privately owned, exclusively adult, touring caravan site in Pidley, Cambridgeshire.